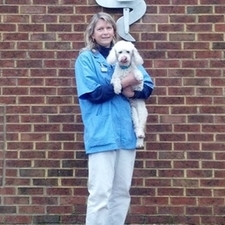 Our Doctors - Gloucester Veterinary Hospital, LTD.
Dr. Schuder began her veterinary career at Gloucester Veterinary Hospital, and has remained ever since. Pictured here with "Scallop", Dr. Schuder also has another dog, "Tanqueray". Her feline friend is "Oyster". She also has two birds named Cedar and Waxy. During time away from the clinic, Dr. Schuder enjoys gardening and water activities. She lives with her husband, Rick. 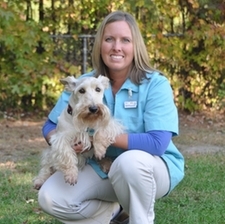 Dr. Sam has been a veterinarian at Gloucester Veterinary Hospital since her graduation from veterinary school in 2000. She chose to settle in Gloucester due to its small town atmosphere and to remain close to family ties in the Richmond and Newport News areas. Pictured here with her dog, Fuzzy (left) and her average brown dog, Skyler (right). She also has two cats, Cabana and Honeybadger. Her hobbies include scrapbooking, rock collecting, and running. Dr. Perkins is a native of Perryville, KY. She currently resides in Gloucester County with her husband Brian, Scottish Terrier-Ollie, English Springer Spaniel-Bentley, black lab-Alex, and their 2 cats-Anna and Falcon. She has a passion for and an involvement in Veterinary Missionary work extending as far as Mexico and Honduras as well as the USA. She also serves as a board member for the local chapter of the American Red Cross. 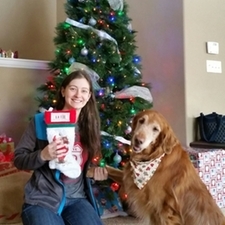 Her veterinary interests include ultrasound, preventative medicine, and orthopedics. Although she has lived here for only a short time, she thoroughly enjoys working and living in beautiful Gloucester, Virginia. Dr. Ortiz is originally from Puerto Rico. He currently resides in Williamsburg with his wife, Cristina, and their daughter Paula, a retired Rottweiler, "Lady", and a Blue and Gold Macaw,"Malu". His veterinary interests include cardiology, surgery, nutrition, and exotic medicine. 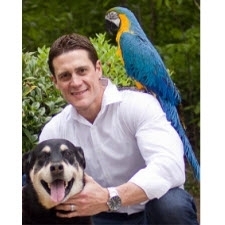 He believes that the single most rewarding aspect of being a veterinarian is to be able to directly connect with many pets and families, therefore allowing him to solidify this exceptional bond through veterinary medicine. During his spare time, Dr Ortiz enjoys exercising and fitness as well as traveling with his family. Dr. Sobczyk is originally from Findlay, Ohio. She currently resides in Yorktown, Virginia. Pictured here with her Golden Retriever, Belle. Her veterinary interest is preventative medicine. She is excited to meet our clients and all their wonderful pets. During her spare time her hobbies include, scrapbooking,reading, playing volleyball, and traveling.